The 2,500 year celebration of the Persian Empire (Persian: جشن‌های ۲۵۰۰ سالهٔ شاهنشاهی ایران‎), officially known as The 2,500th year of Foundation of Imperial State of Iran (Persian: دوهزار و پانصدمین سال بنیانگذاری شاهنشاهی ایران‎), consisted of an elaborate set of festivities that took place on 12–16 October 1971 to celebrate the anniversary of the founding of the Imperial State of Iran and the Achaemenid Empire by Cyrus the Great. The intent of the celebration was to demonstrate Iran's ancient civilization and history and to showcase its contemporary advances under His Imperial Majesty Mohammad Reza Shah, the last Shah of Iran.The extravagance of the celebrations was striking. Some later historians came to think that this excess had contributed to events that resulted in the Iranian Revolution and eventual replacement of the monarchy with an Islamic Republic under the Grand Ayatollah Ruhollah Khomeini, the leader of the revolution. He was supported by a wide range of people, including various Islamist and leftist organizations, and student movements. This century represents the peak of a period in human history popularly known as Axial Age. This period saw the emergence of five major thought streams springing from five great thinkers in different parts of the world: Buddha and Mahavira in India, Zoroaster in Persia, Pythagoras in Greece and Confucius in China. Pāṇini, in India, composed a grammar for Sanskrit, in this century or slightly later. This is the oldest still known grammar of any language. Darius III (c. 380 – July 330 BC), originally named Artashata and called Codomannus by the Greeks, was the last king of the Achaemenid Empire of Persia, from 336 BC to 330 BC. Artashata adopted Darius as a dynastic name.His empire was unstable, with large portions governed by jealous and unreliable satraps and inhabited by disaffected and rebellious subjects. The Immortals (Persian: جاویدان‎ jâvīdân, Ancient Greek: Ἀθάνατοι Athánatoi) also known as the Persian Immortals or Persian Warriors was the name given by Herodotus to an elite heavily-armed infantry queued unit of 10,000 soldiers in the great army of the Achaemenid Empire. This force performed the dual roles of both Imperial Guard and standing army. The force consisted mainly of Persians, but also included Medes and Elamites. Essential questions regarding the unit remain unanswered, because authentic sources are missing. Lydia (Assyrian: Luddu; Greek: Λυδία, Lydía; Turkish: Lidya) was an Iron Age kingdom of western Asia Minor located generally east of ancient Ionia in the modern western Turkish provinces of Uşak, Manisa and inland İzmir. Its population spoke an Anatolian language known as Lydian. Its capital was Sardis.The Kingdom of Lydia existed from about 1200 BC to 546 BC. At its greatest extent, during the 7th century BC, it covered all of western Anatolia. In 546 BC, it became a province of the Achaemenid Persian Empire, known as the satrapy of Lydia or Sparda in Old Persian. In 133 BC, it became part of the Roman province of Asia. Panyassis of Halicarnassus, sometimes known as Panyasis (Ancient Greek: Πανύασις), was a 5th century BC Greek epic poet from Halicarnassus in the Persian Empire (modern-day Bodrum, Turkey). Sasanian Armenia, also known as Persian Armenia and Persarmenia (Armenian: Պարսկահայաստան – Parskahayastan), may either refer to the periods where Armenia (Middle Persian: 𐭠𐭫𐭬𐭭𐭩‎ – Armin) was under the suzerainty of the Sasanian Empire, or specifically to the parts of Armenia under its control such as after the partition of 387 AD when parts of western Armenia were incorporated into the Byzantine Empire while the rest of Armenia came under Sasanian suzerainty whilst maintaining its existing kingdom until 428. In 428, Armenian nobles petitioned Bahram V to depose Artaxias IV (r. 422); Bahram V (r. 420–438) abolished the Kingdom of Armenia and appointed Veh Mihr Shapur as marzban (governor of a frontier province, "margrave") of the country, which marked the start of a new era known as the Marzpanate period (Armenian: Մարզպանական Հայաստան – Marzpanakan Hayastan), a period when marzbans, nominated by the Sasanian emperor, governed eastern Armenia, as opposed to the western Byzantine Armenia which was ruled by several princes, and later governors, under Byzantine suzerainty. The Marzpanate period ended with the Arab conquest of Armenia in the 7th century, when the Principality of Armenia was established. An estimated three million Armenians were under the influence of the Sasanian marzpans during this period.The marzban was invested with supreme power, even imposing death sentences; but he could not interfere with the age-long privileges of the Armenian nakharars. The country as a whole enjoyed considerable autonomy. The office of Hazarapet, corresponding to that of Minister of the Interior, public works and finance, was mostly entrusted to an Armenian, while the post of Sparapet (commander-in-chief) was only entrusted to an Armenian. Each nakharar had his own army, according to the extent of his domain. The "National Cavalry" or "Royal force" was under the Commander-in-chief. The tax collectors were all Armenians. The courts of justice and the schools were directed by the Armenian clergy. Several times, an Armenian nakharar became Marzpan, as did Vahan Mamikonian in 485 after a period of rebellion against the Iranians. Shah (; Persian: شاه‎, translit. Šāh, pronounced [ʃɒːh], "king") is a title given to the emperors, kings, princes and lords of Iran (historically known as Persia in the West). It was also adopted by the kings of Shirvan (a historical Iranian region in Transcaucasia) namely the Shirvanshahs. It was also used by Persianate societies such as the rulers and offspring of the Ottoman Empire (spelled as Şah and Şeh in the modern Turkish language), Mughal emperors of the Indian Subcontinent, the Bengal Sultanate, as well as in Afghanistan. In Iran (and the Greater Iran region) the title was continuously used; rather than King in the European sense, each Persian ruler regarded himself as the Shahanshah (Persian: شاهنشاه‎, translit. Šāhanšāh, "King of Kings") or Padishah (Persian: پادشاه‎, translit. Pādešāh, "Master King") of the Persian Empire. The Tahirid dynasty (Persian: طاهریان‎, Tâhiriyân) was a dynasty, of Persian dihqan origin, that effectively ruled the Khorasan from 821 to 873 while other members of the dynasty served as military and security commanders for the city of Baghdad from 820 until 891. The dynasty was founded by Tahir ibn Husayn, a leading general in the service of the Abbasid caliph al-Ma'mun. Their capital in Khorasan was initially located at Merv but was later moved to Nishapur. 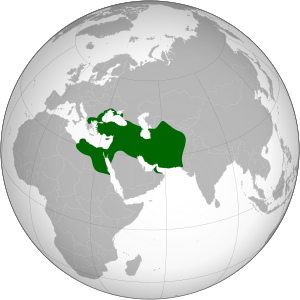 The Tahirids have been described as the first independent Iranian dynasty after the fall of the Sassanian Empire. However, according Hugh Kennedy: "The Tahirids are sometimes considered as the first independent Iranian dynasty, but such a view is misleading. The arrangement was effectively a partnership between the Abbasids and the Tahirids." And instead, the Tahirids were loyal to the Abbasid caliphs and enjoyed considerable autonomy rather than being independent from the central authority. The tax revenue from Khorasan that was sent to the caliphal treasury was perhaps larger than those collected previously.